Posted on 11, September 2018 by EuropaWire PR Editors | This entry was posted in Aviation & Aerospace, Industrial, Technology, Transportation & Logistics, Travel, United Kingdom and tagged aircraft, Aviation, CMIG Aviation Capital, LessorCare, lessors, Peter Gao, Rolls-Royce, Troy Wang. Bookmark the permalink. LONDON, 11-Sep-2018 — /EuropaWire/ — Rolls-Royce has announced CMIG Aviation Capital as a new customer for LessorCare, the pioneering new service tailored specifically to the needs of lessors. CMIG Aviation Capital will adopt the service across their existing and future fleet of Trent-powered aircraft, drawing together a range of services under one simple, flexible and comprehensive framework. LessorCare comprises one single, comprehensive agreement for all Trent engine types, giving customers access to all the services that they need throughout the engine lifecycle. It allows lessors to pay for what they want when they need it. The benefits are faster and easier access, the incorporation of services today and for the future, and the maximising of possible return on investment. 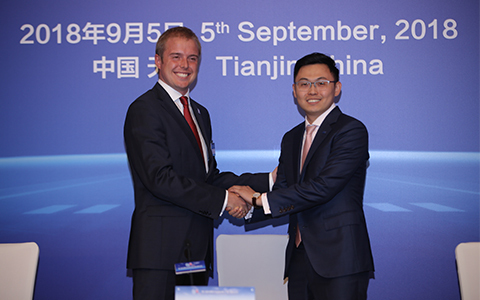 In China, Rolls-Royce believes that LessorCare will provide an excellent platform to deliver the most effective and efficient services to the growing and ambitious aircraft leasing industry, and LessorCare forms a key element of the way in which Rolls-Royce will look to support this industry going forwards. Customer support – Rolls-Royce’s network of technical support, publications, and training to optimise responsiveness and keep aircraft earning revenue. Transition services – a range of maintenance and availability services, to ensure aircraft move more quickly and efficiently between leases. Services include engine maintenance and remarketing support. Asset management – a range of solutions that build on Rolls-Royce’s experience of working in close partnership with airlines worldwide to maximise engine values through their life-cycle. These solutions will include LifeKey which will be our enhanced form of OPERA (Operating Lessor Engine Restoration Agreement) that provides portability and liquidity for maintenance value. Beyond these initial services, Rolls-Royce continues to work with customers to develop LessorCare further, working towards even closer integration of aftermarket services and aircraft lease agreements. Rolls-Royce employs 50,000 people in 50 countries. More than 18,200 of these are engineers.